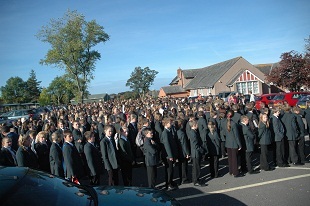 When the fire alarm goes off at NTS, some 1400 people walk totally silently out of school and assemble in perfect order. It isn’t quite to the standard of the changing of the guard, but it’s not all that far behind. What might this tell you? Well, first of all that we take health and safety matters seriously. But actually, there’s a deeper significance. This is a disciplined school. Wigton kids are certainly not softies and, as in most places, teachers at NTS need to earn their pupils’ respect. Nonetheless, despite our comprehensive intake, teaching here is a doable job; it’s a matter of great importance to us that there should be no unteachable classes at NTS. Generally we regard our house style as being relaxed and informal. Uniform, however, offers a reminder to everyone that, when it comes down to it, the school sets the standard, not its pupils. And how is all this possible in an ordinary comprehensive school in the 21st Century? – Because we’re serious about what we do – and because our pupils (and their parents) actually approve of the fact. They know that the reason our pastoral staff set high standards is because they care about them enough to be ambitious for them. They even seem to appreciate the importance of the fact that their classroom teachers judge their own performance in terms of their skills as pedagogues, not crowd-control experts, baby sitters or social workers.